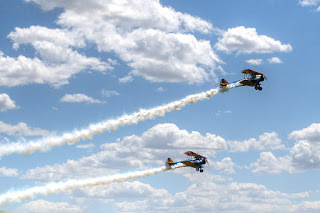 Saturday was the Annual Bi-Plane Fly In here in Junction City, Kansas. Our weather the week before it had been great so there were a good amount of planes there. At the end of the show, several planes took off and did some acrobatic flying with smoke trails. That was quite fun. This is 2 of them which I believe were Stearmans.